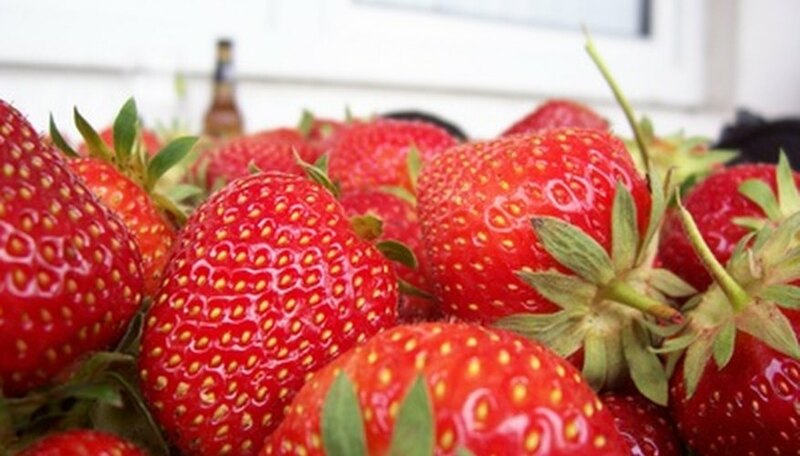 Strawberries are a popular berry grown in home gardens for use as a fresh fruit and in jams and desserts. Strawberry plants grow easily in large barrels in areas where there is limited space. It is possible to harvest up to 50 pints of strawberries from one 55-gallon barrel planter, which can hold 40 to 50 strawberry plants. For best results, refresh the barrel soil each year and set new strawberry plants in the holes. Wash the barrel to remove any residue that may be harmful to the strawberry plants. Remove the bottom of the barrel or cut four 2-inch diameter drainage holes with a drill or saw. Place holes in the side of the barrel for the strawberry plants. Cut 3-inch diameter holes spaced a minimum of 8 inches apart around the barrel. Stagger the rows of holes so the barrel is evenly covered. Fill the bottom of the barrel with 2 inches of coarse gravel. Mix one part good quality garden soil, one part coarse sand and one part peat moss to make a strawberry planting medium. Add a 6-6-6 fertilizer to the soil mix. Cut a piece of 3/4 inch diameter pipe to a length approximately one inch taller than the barrel. Drill 1/8 inch holes throughout the pipe at a spacing of 1 to 2 inches. Place the pipe vertically in the center of the barrel and fill with coarse sand. Fill the barrel with soil to the first row of planting holes. Place strawberry plants in the holes and gently fan the roots out. Carefully cover the roots with soil, making sure the crown is uncovered. Continue to add soil and plants to each level of rows. Fill soil to one inch below the rim of the barrel. Place a layer of black plastic mulch over the top layer of soil and cut holes 8 inches apart. Set strawberry plants in the top holes and gently cover the roots with soil. Tuck the plastic mulch between the soil and side of the barrel to hold it in place. Water the plants using the pipe set in the middle of the barrel. Apply water though the center pipe twice a week to keep the soil moist during the growing and fruiting season.